So anyways. Soccer camp was awesome...ly tough. But I knew it would be. Having 6 hours of soccer a day and only 7 hours of sleep each night, I was SO sore and tired! But now I'm prepared for my team soccer camp which is this coming week and my preseason at the end of August. Do any of you play a fall sport that you're already preparing for? I'm also so pumped because the Olympics have started! I watched the US Women beat France in soccer on Wednesday, which was awesome. And the Opening Ceremonies were amazing (as always!). Did anyone else think the Queen ACTUALLY jumped at first? Haha! It's unbelievable how much money they spend on the spectacle! My favorite events are gymnastics and, of course, swimming. If you're in the US (or if you're not but you know what I'm talking about), who do you prefer? Lochte or Phelps? I was bummed to see that Phelps didn't even medal tonight, but glad that Lochte got the gold! Which event is your favorite? Ultra cute outfit and the bracelets are sweet!! Such great colors and how amazing that you won so many things! really nice outfit! I like the print of the skirt! 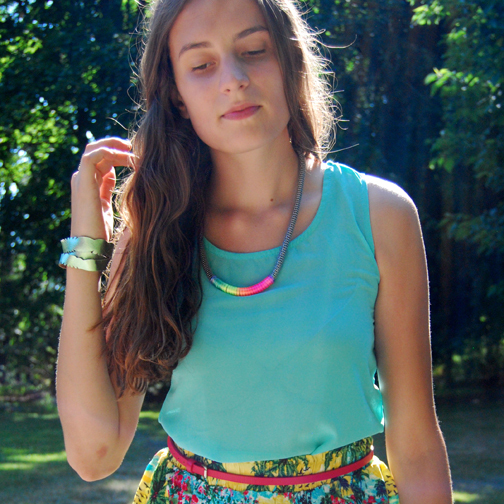 oooh i am really loving that tropical print skirt! lovely otfit!! Ooooh, welcome back Rory, been missing your outfit posts! This one is a definite winner too. Love the tropical skirt, and your cool cut out tank. Nice sandals too! Dang, sounds like loooong days. Haha, but I bet it's paid off :) Good luck at the team camp! you look stunning. beautiful printed skirt. You always have the funkiest accessories... Seriously, that necklace? Way cool! I love your tropical outfit. The shoes are definitely my favorite along with color scheme. I've been addicted to the Olympics this year! Everything about it excites me. I love your look :D so tropical and fresh. I wish I have all your clothes hahaha. Love it! I watched the opening ceremony. It was awesome <3 love the musics, J.K. Rowling was there <3 so happy! I love this tropical trend, you have styled it so well! Lovin' the prints and the colors!